Joye Umback from Art in the Garage. Photo: Ian Campbell. 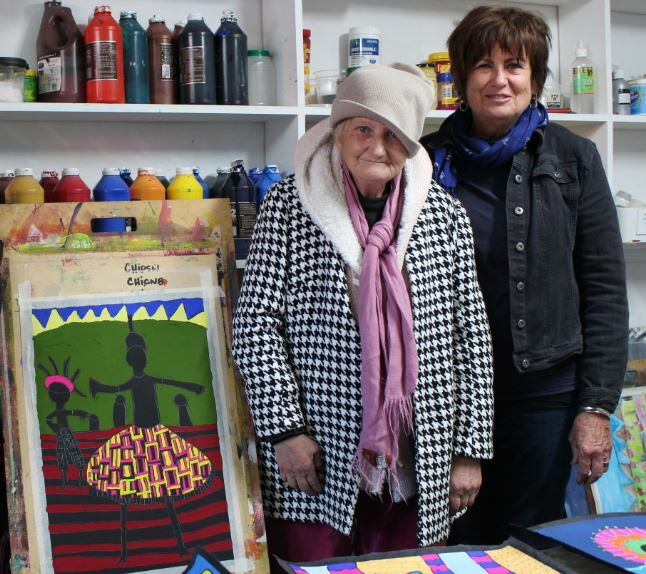 Canberra is getting a taste of the colour, pride, and free spirit of the Bega Valley’s long-running ‘Art in the Garage‘ program. The ability of artists like Joye Umback and Miriam Kydd shines brightly through the works currently on display at the Tuggeranong Arts Centre (TAC). 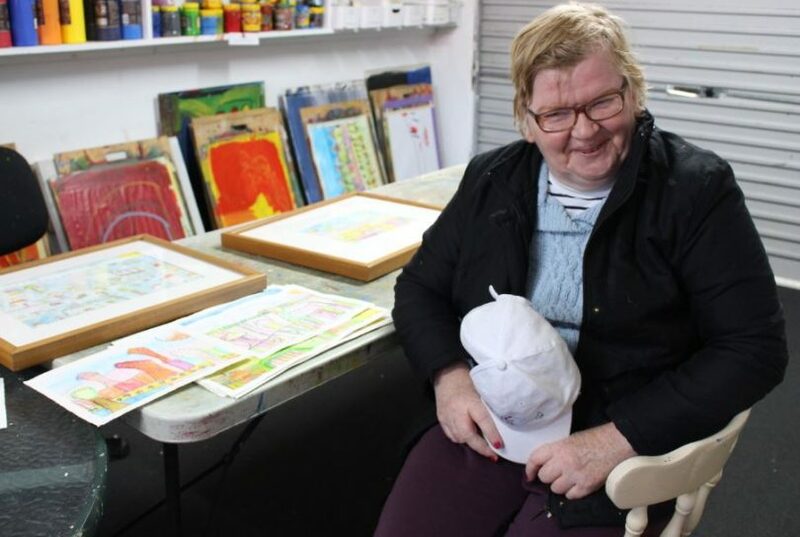 It’s the type of talent and skill Tulgeen Disability Services has been fostering in their Bega suburban garage for 17 years. “The artists I work with lack inhibition, they have no fear of judgment or concern for what people will think,” says Tulgeen art mentor, Jenny MacKenzie. Ned Hiding From the Trooper, By Wayne Ramus. 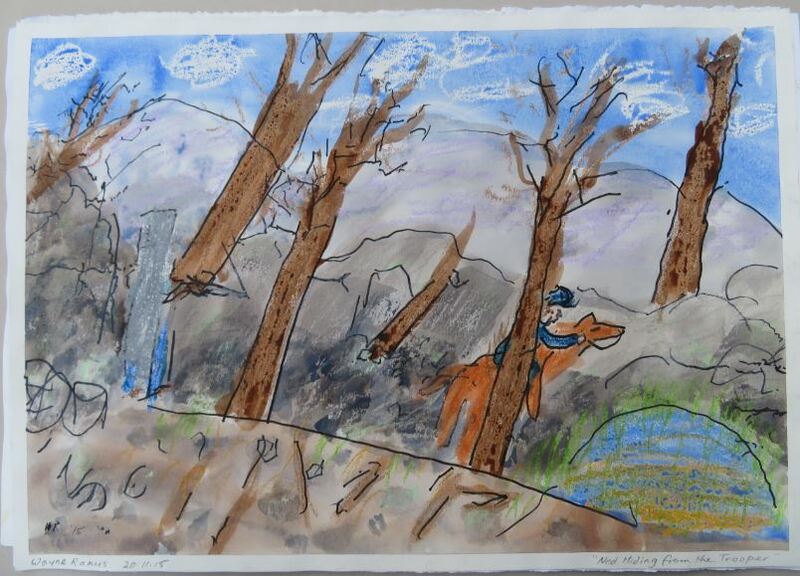 Works from 21 Tulgeen artists are on show at TAC until Friday 6 pm (August 24) featuring landscapes, abstract expressionist interpretations, portraits, and storytelling, showcasing memories and experiences, using watercolours, gouache, acrylics, pastels, pencil and pen work on paper and canvas. One of the stars of the show, Miriam Kydd, grew up in the bush at Wolumla. She says she loves working with bright colours: “I reckon it cheers people up,” she said. “I just love art, it relaxes you, and then to get them into exhibitions and to sell them – you can get lots of money for them,” Miriam says. Miriam Kydd and Jenny MacKenzie with one of Miriam’s works in progress. Photo: Ian Campbell. Joye Umback has a flair for drawing street scenes featuring people she knows but is also inspired by anything new happening in her life. She is super excited about exhibiting in Canberra. “I like everything about it,” Joye says. With a sneaky grin, Joye laughs at the suggestion she likes a gossip just as much. Mentor Jenny MacKenzie says art isn’t the only thing to bounce between the walls of Tulgeen’s Eden Street garage. “It’s a bit like a psychiatrist’s couch sometimes, lots of things come out, but that’s part of art therapy, people who perhaps can’t express themselves well verbally find other ways to express themselves,” she says. The current exhibition at Tuggeranong is the first time Art in the Garage has been exhibited as a group outside of the Bega Valley. “Everyone is represented by at least one artwork, we are all very excited and most will be for sale. The money gives our artists some independence, they put it towards things like holidays,” Jenny says. “These guys can be pretty isolated at times, so this promotes inclusion and identity as well. 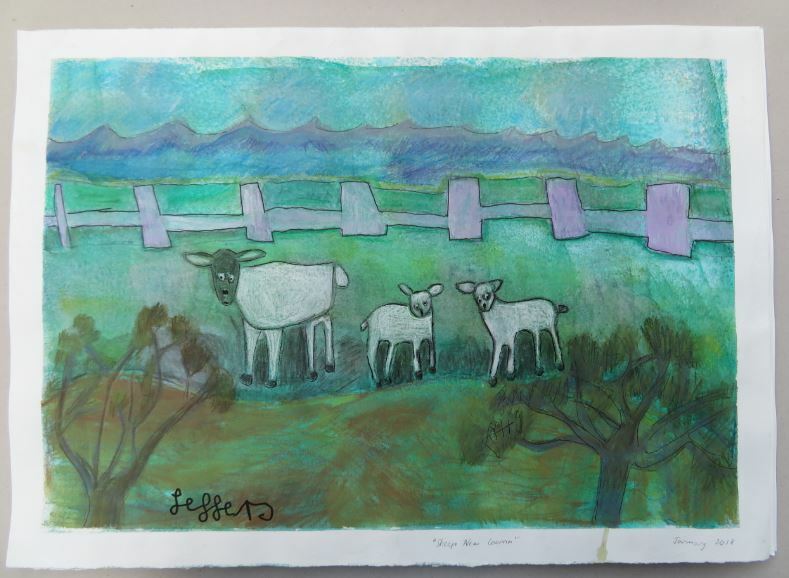 “Sheep Near Cooma” by Jeffery Young. ‘Hinterland’ by Art in the Garage continues until Friday, August 24 at Tuggeranong Arts Centre, open Monday to Friday, 10 am to 6 pm and Saturday 10 am to 4 pm, entry is free. After Canberra, Tulgeen will exhibit at the Bega Valley Regional Gallery in conjunction with the Shirley Hannan National Portrait Prize, October 26 till November 23. Then in December at Raglan Gallery in Cooma, a joint exhibition with Challenge Cooma and South East Arts. Bega Valley Innovation Hub launches October 29 – come & see the future?